I occasionally read about people who don’t like carrot cake, but I don’t think I’ve ever actually met one. Everyone I know loves it (or at least they’re too ashamed to admit that they don’t – as they should be). I think it’s the cream cheese frosting. Who doesn’t love cream cheese frosting? What’s not to love? 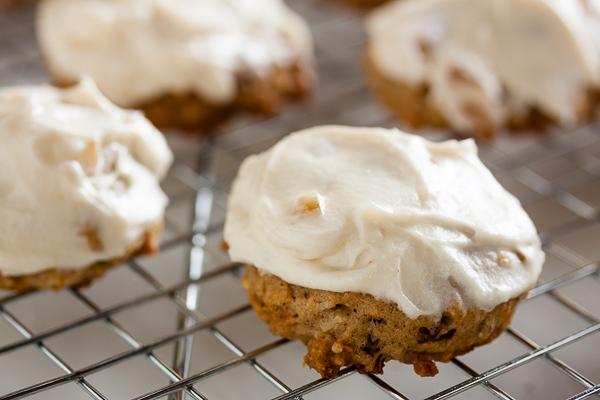 I’ve never had a carrot cake cookie before, but doesn’t it sound ideal? Bite-sized goodness! 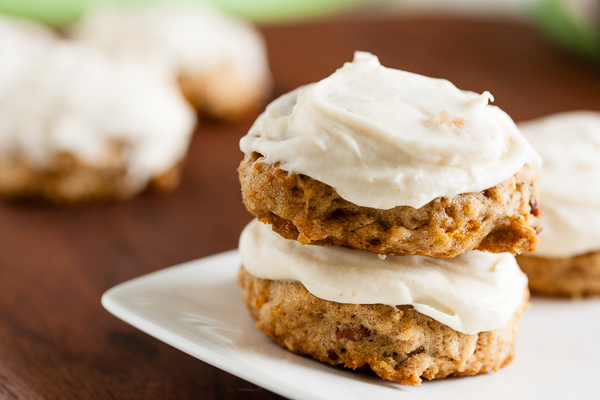 In my travels through my cookbooks, I’ve run into two different carrot cake cookie recipes and I’ve kind’ve kept them in mind ever since. This is the first I’m trying. 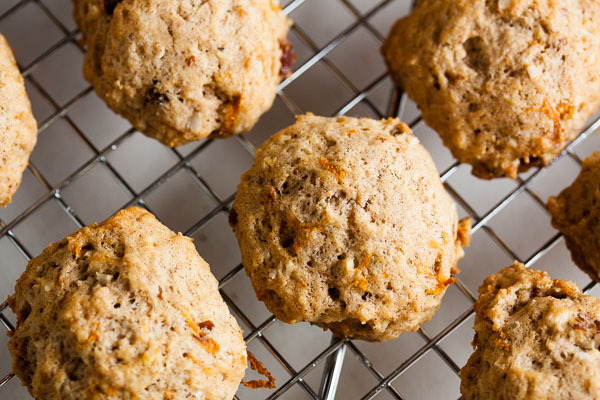 The cookie itself contains the traditional grated carrot, coconut, raisins & pecans that you’d expect to find, but also a mixture of slightly different spices. The frosting is where it gets really interesting though. Cream cheese, of course. 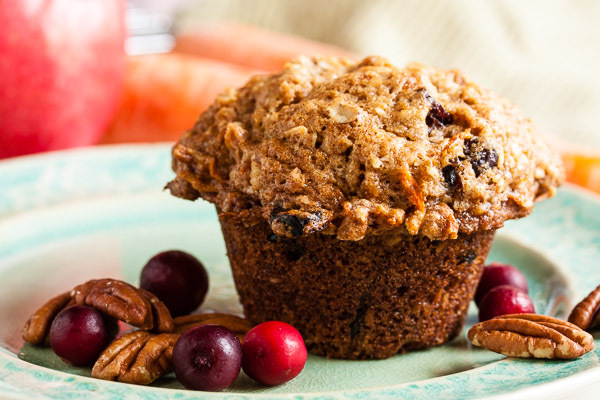 It contains some ground ginger, but also a generous amount of finely-chopped candied ginger. And spiced rum in addition to the vanilla. Mmmmm. This is some seriously good frosting. These cookies didn’t spread very much at all, and ended up being quite small. With the quantity of leaveners in this cookie, I was expecting them to be huge. I’m wondering if I didn’t cream the butter and sugar enough, because when I added the eggs they didn’t incorporate very smoothly, and the batter looked a bit lumpy. Straight from the oven, prior to frosting, this is not a good cookie. There’s very little sugar in the cookie itself and it’s counting on the frosting for the sweetness. So do not skip the frosting. In fact, don’t even bother tasting them until after they’re frosted. Speaking of tasting, this is a cookie that’s best if allowed to rest for a day before serving. The day I baked them, I found the spices seemed too harsh. I couldn’t put my finger on it, but the balance was just off somehow. I was tempted to give this recipe a thumbs down. The next day, however, that thumb turned way up. The spices had had a chance to blend together and find their balance. I’ve eaten several. One of my coworkers has said this is her new favourite cookie (I’m beginning to think she’s a bit fickle, though, because she says this almost every week). My only complaint about this cookie is that it’s a bit difficult to transport because of the frosting. I ended up refrigerating them to firm it up a bit, and then organized them flat in a tupperware container with wax paper between each layer. But that’s hardly a real complaint. Adapted from Tracey Zabar's One Sweet Cookie, recipe by Amar Santana. The recipe states it yields about 40 cookies; I got 50 using a small scoop. Spread the pecans in a single layer on a baking sheet and toast for approximately 6-8 minutes, until lightly browned and fragrant, turning the nuts a few times to cook evenly. Remove from the heat and allow to cool before coarsely chopping (the recipe didn't actually call for them to be chopped, but I preferred to have smaller pieces of nuts in these cookies). In a medium bowl, whisk together the flour, baking soda, baking powder and spices (in the original recipe, the spices are added to the creamed butter/sugar before the flour, but I thought this would distribute them more evenly). Set aside. 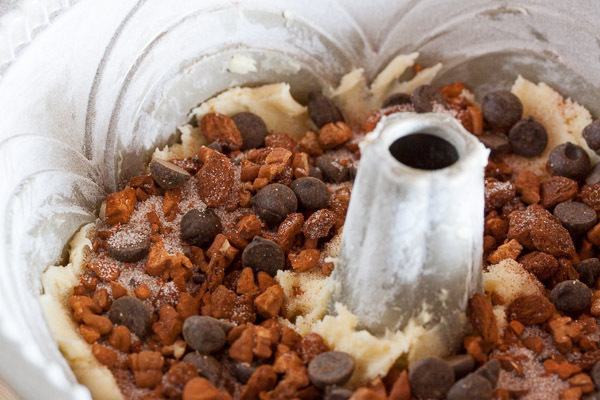 In the bowl of a stand mixer fitted with the paddle attachment, beat the butter and brown sugar together on medium speed until light and fluffy, about 3 or 4 minutes. Scrape down the sides of the bowl and add the eggs, one at a time, beating well after each. Add the vanilla and beat again to incorporate. 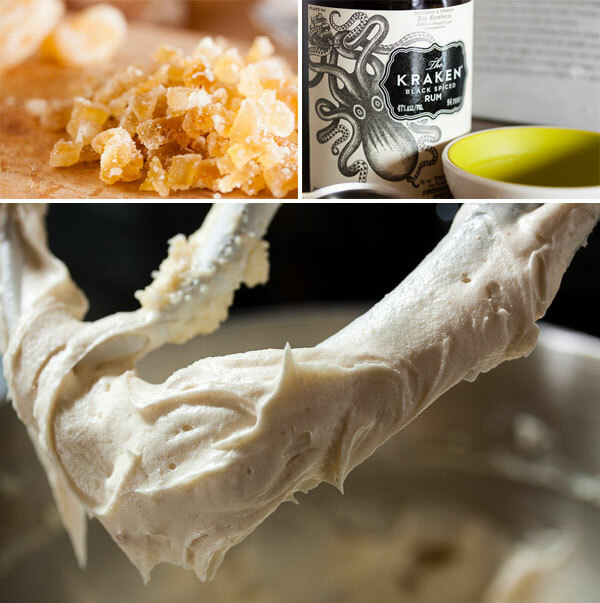 Turn the mixer down to low and add the dry ingredients, mixing until just barely combined. 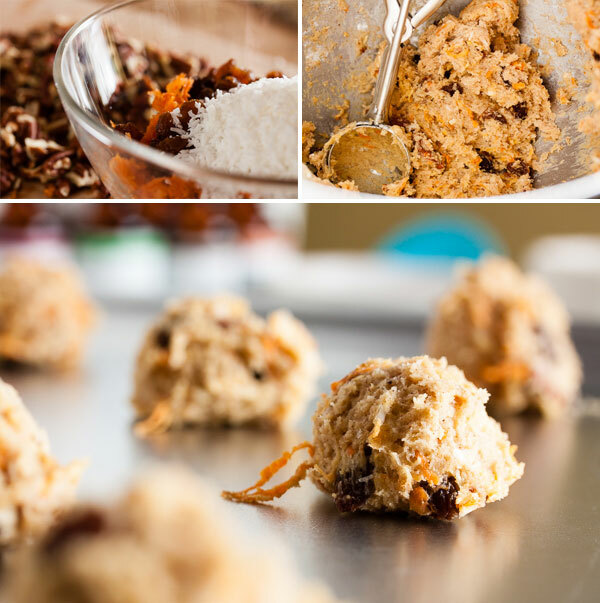 Remove from the mixer and fold in the carrots, raisins, coconut and pecans, either with a spatula or by hand. I prefer to knead inclusions in by hand to ensure they're distributed evenly. Bake for about 12-15 minutes, until lightly golden brown around the edges and the cookies are set, rotating the baking sheet halfway through. 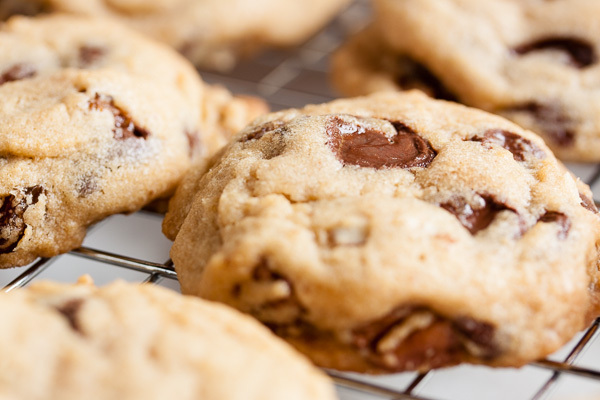 Allow to cool on a wire rack for a few minutes before removing the cookies from the pan and allowing them to cool completely before frosting. In the bowl of a stand mixer fitted with the paddle attachment, beat the butter and cream cheese on medium speed until creamy. Turn the mixer to low and add the confectioner's sugar 1/2 cup at a time (if you add too much you'll end up with powdered sugar everywhere). Increase the speed to medium high and continue beating until light and fluffy. Add the ginger, candied ginger, salt, rum and vanilla, and beat until combined. Spread the frosting on top of the cooled cookies – this recipe makes a lot, so you can afford to be quite generous with how much you use. 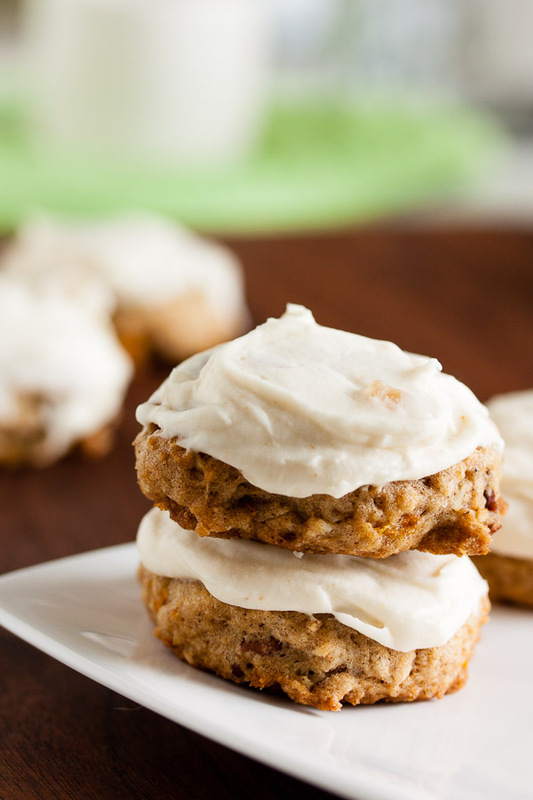 These cookies look SO delicious, I’m especially loving that thick layer of cream cheese frosting. I could definitely devour one right now, pinned! Thanks Thalia! I could just eat a bowl of the frosting alone. Would that be wrong?